✔︎ Affordable and locally owned! First, select a plan that works for you. Each week you'll receive a text from us with the link to our new menu where you can make your selections for delivery the following week. We'll send you text or email reminders so you don't miss out on ordering your meals! Our order deadline is Wednesday at 9 pm to receive meals the following week. Our skilled kitchen staff create your meals from scratch each week, with care to accommodate your allergies and dietary preferences. Your meals will be delivered once per week for you to refrigerate and reheat when it's convenient for you. No more fuss when it comes to meal times. You'll have healthy, personalized meals in your fridge ready to go whenever hunger strikes! Nourish your body and satisfy your hunger with our breakfast, lunch, and dinner meals so that you can enjoy the most important things in life. You don’t need to place an order every week, or even every month. Simply order what you want, when you want it! If you start out ordering 10 meals per week but realize you only need 5, or if you no longer need our service, it's super easy to switch or cancel your plan inside your account. Choose 1 or more meals per week. Choose a minimum of 5 meals per week and save 2% per meal. Choose a minimum of 10 meals per week and save 4% per meal. - couples who desire work-week lunches or dinners provided. Choose a minimum of 15 meals per week and save 6% per meal. We deliver on Mondays and Wednesdays between 9am and 6:30pm. You may order meals for delivery once or twice per week (most clients receive meals once per week). We can deliver to your home or your workplace. Monday delivery is $10; Wednesday delivery is $9. You will receive a text on Friday with your estimated delivery time (ex: 11:15 AM). Your meals will need to be refrigerated immediately upon receiving. If you won’t be home to accept your delivery, be sure to set out a cooler for our staff to place your meals in on warmer days. Be sure to include enough ice packs in your cooler for it to maintain a refrigerator-like temperature until you get home. We are unable to reschedule deliveries or take requests for specific delivery times. If we arrive to deliver your meals but are unable to deliver them, you will still be charged for your meals and for your delivery. If we can return to our kitchen within a safe amount of time to refrigerate your meals, we will communicate with you to schedule a time for you to pick up your meals. If you forget to leave out your cooler, we will call you to see if we can arrange another delivery location or solution. If we cannot reach you, we will still deliver your meals, OR if we can return to our kitchen within a safe amount of time to refrigerate your meals, we will communicate with you to schedule a time for you to pick up your meals. Not on our list? Shoot us an email to let us know your location and that you are interested in receiving meals - we're always expanding our delivery area! Meals on our menu may be marked according to the following diets. Below you can find more information about what these diets mean to us and how we follow them. Dairy-free - Our dairy-free meals never contain milk products of any kind. All of our kitchen staff are trained and understand the importance of preventing cross-contamination. All meals on our menu are noted to either contain, or be free from this allergen. Gluten-free - Although we do use some wheat products in our kitchen, all of our kitchen staff members are trained in preventing cross contamination with our gluten-free meals and this is taken seriously in our kitchen. Meals that contain oats are marked as gluten-free, as oats do not inherently contain any gluten and their packaging does not indicate that gluten is present. However, we know that some people who follow gluten-free diets only eat certified gluten-free oats, so wanted to make this information known. All meals on our menu are noted to either contain, or be free from this allergen. Keto - For clients following the Keto diet, we have created Keto Bundles, where you may order servings of our proteins, low-carb veggies and our cauliflower “rice".” These bundles are viewable on our menu. Some other meals on our menu may also be Keto-friendly, but are not marked as such. Nut-free - The vast majority of our meals are free from nuts. Meals that contain nuts are noted on our menu and the nuts used in the meal are specified in the meal ingredients. Paleo - Meals that meet Paleo guidelines are noted on our menu. For those following the Paleo diet, please note that we do allow for citric acid in our Paleo-approved meals, though we know this is a controversial ingredient in the Paleo community. Plant-Based - For clients following a plant-based diet, we have created Plant-Based Bundles, where you may order servings of our plant-based proteins and our veggies. These bundles are viewable on our menu. Some other meals on our menu may also be plant-based, but are not marked as such. Soy-free - Our meals marked as soy-free do not contain soy of any kind, and our kitchen staff are trained in and take necessary precautions to prevent cross contamination. All meals on our menu are noted to either contain, or be free from this allergen. Whole 30 - We love enabling clients to take the Whole 30 challenge! Meals that meet Whole 30 guidelines are noted on our menu. Vegan - Vegan meals are noted as such on our menu, and do not contain animal products of any kind, with the exception of honey. Our Plant-Based Bundles also support vegan diets. Vegetarian - Vegetarian meals are noted as such on our menu and do not contain meat or seafood, but do contain eggs. Our Plant-Based Bundles also support vegetarian diets. *Food by Bel does not suggest or recommend any specific diet(s). Our goal is to support our clients and the decisions they make about their diet with their dietitian, nutritionist, or other healthcare professional, and to enable them in walking out those decisions. Before making the choice to follow any set of dietary guidelines, we strongly suggest consulting a qualified health and wellness professional whom you trust. Food by Bel operates out of a community kitchen space called Food Fort. It is health department inspected and approved commercial kitchen space for food makers of all kinds! 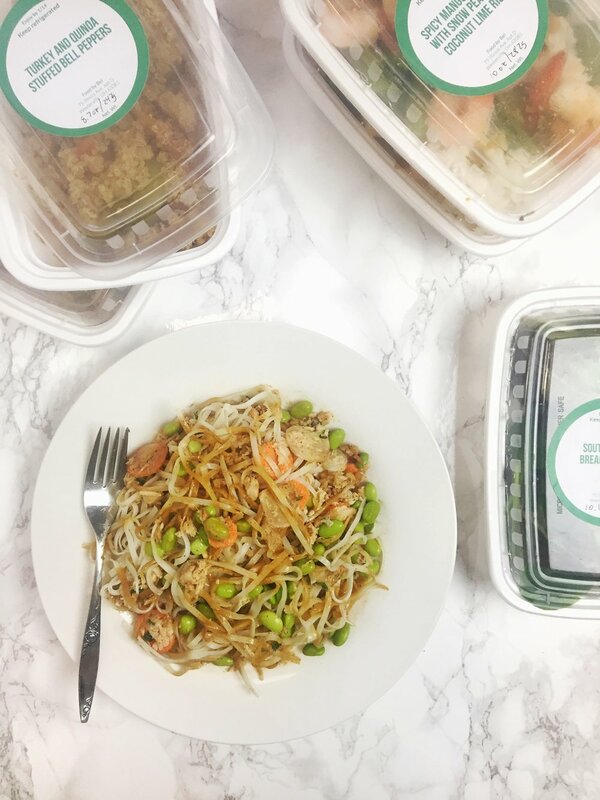 We package our meals in plastic, microwavable containers for easy reheating, and reheating instructions are included on our meal labels. Your meals will reheat well if microwaved for 30 - 90 seconds. Meals can also be removed from their container and reheated in the toaster oven, oven or on the stove top until heated through. Our plastic meal containers are reusable, recyclable, dishwasher safe and BPA free! Please reuse recycle your containers with your local waste management company. All of our meal ingredients (and sub-ingredients) are listed on our menu for your convenience! Simply click the “more+” button beneath a meal to see it’s ingredients. Produce - We source most dirty dozen produce items organically when possible. Poultry - We use local, pastured chicken and turkey from Mosley's Meat Market. *✝ Federal regulations prevent the use of antibiotics and hormones in poultry. White fish - We use wild caught Cod or other wild caught white fish. Shrimp - We strive to obtain shrimp with no preservatives. Oils - We only use olive, sesame and avocado oil (whole30 and Paleo approved) in our kitchen. We use avocado oil for cooking and olive oil for dressings etc. Meal ingredients (mainly fruits and veggies) are subject to change from our listed descriptions based on what is freshly available from our suppliers. You'll always be notified if you're receiving something different from what you ordered. We're committed to making sure you're satisfied with your meals. If we make an adjustment you don't like, we'll make it right! * Sometimes we run out of or can’t get our hands on our precious Mosley’s meat. When this happens, we source free-range or organic chicken, high-quality turkey, grass-fed beef, and hormone free pork from our local grocery stores. ✝ Our meat salads are exceptions to the above sources and characteristics of our chicken and salmon. For our chicken salad, we use all-natural Keystone canned chicken. For our salmon salads, we use wild alaskan pink salmon. Email us at foodbybel@gmail.com or text us at 614-968-7187 to cancel your order. Cancel your order for a 100% refund. A cancellation fee of $25 will be applied, as all orders have already gone into production. We will refund your card for the cost of your order minus the $25 fee. Unfortunately we are unable to cancel or refund orders during this time. The ingredients for your meals are being purchased and preparations are being made for your meals to be cooked and assembled in our kitchen! Unfortunately we are unable to cancel or refund orders during this time. The ingredients for your meals have been purchased and preparations are being made for your meals to be cooked and assembled in our kitchen! At this time we are only able to provide nutritional information for a few of our meals. When we have nutritional information assembled, it will be available on our menu. Your meals will arrive with a best-by date that is 5 days from the date of delivery. Some meals stay fresh for even longer! Yes! Most of our meals are freezable (we don't recommend freezing sandwiches, salads or the like). You can freeze your meals right in the containers they come in. If you are freezing soup, we recommend transferring some or all of the soup to another container, so that the liquid doesn't crack the container when it freezes and expands. We can't take specific requests like "omit onion" or "sub broccoli for green beans" BUT all of our ingredients are listed on our menu, so you will be able to check to see if a meal contains an ingredient you don't like (bell pepper, garlic, tomatoes, etc). Simply click the "more+" button under each meal to see it's ingredients. Can you provide meals for someone on a Keto diet? Yes! The best option for clients following the Keto diet is to order from the bulk options on our menu. We offer bulk portions of cruciferous veggies, and proteins that are Keto-friendly - they simply arrive in bulk for you to assemble into individual meals. 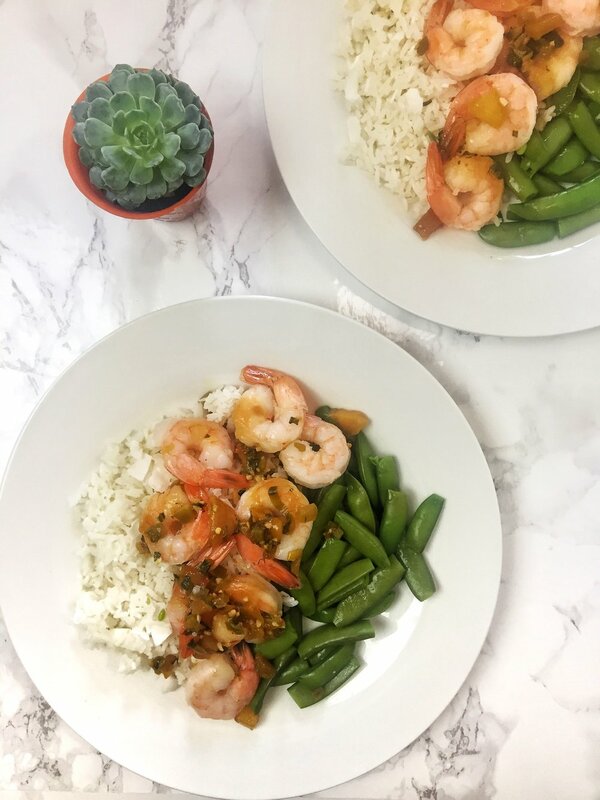 Keto client's can also sub our cauliflower "rice" in place of starches for meals that usually come with rice or other grains when we offer this option. We do not have nutritional information available at this time. We use grains or vegetables for the starch component of our meals. For clients desiring meals that are even lower in carbs, we offer cauliflower "rice" as a substitute for our grains. How to the meal costs vary from plan to plan? We can help you stick to it! Learn more about working one-on-one with one of our Personal Chefs at the to the right. We have cost effective options for you! Learn about working with one of our Personal Chefs at the link to the right. Is there a service you are particularly interested in? We look forward to discussing your needs and how we can help! Thanks so much! We are so glad you're here and can’t wait to help you! Eating healthily IS possible, even when it feels overwhelming. Isabel will give you a call soon to determine the best way our company can help you achieve your healthy eating goals. Click the button above to schedule your free phone consultation with Isabel, Founder of Food by Bel, to help determine how our company can best serve your family.